1. To start, I'll wet my face with a flannel before using the Glossier Milky Jelly Cleanser- my holy grail product. 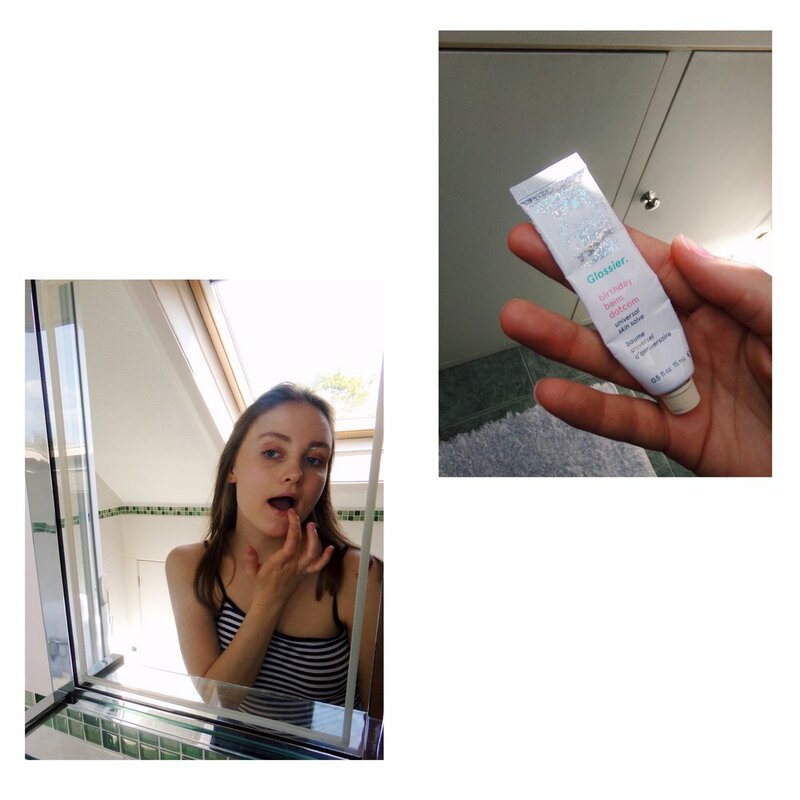 I've talked about this in detail in my blog post I wrote on the Glossier products that I own but it really is the perfect morning cleanser- so refreshing. If I'm going to be washing my hair that morning, I'll use this in the shower but if not I just wash it off with a flannel, which works fine. 2. Next, I spray my face with the Mario Badescu rosewater. I'm really not sure if this does anything but I love the smell and the feeling of it on my skin. It's so refreshing in the morning and, because my evening skincare routine is quite de-hydrating, it's a good way to really hydrate my skin at the beginning of the day. 3. The final step of my morning skincare routine (I told you it was basic) is this moisturiser from Lush called 'Enzymion'. I've used it for years and, despite trying various other moisturisers, I always come back to it. It's formulated for oily skin which makes it perfect for me and it smells of lemons which makes it really refreshing. It moisturises the skin without making you feel like you've got a heavy moisturiser on, which I like as I hate feeling like I have anything on my face. 4. Moving on to make-up, I've just started using The Ordinary Serum foundation in the shade 1.2N and I'm loving it. It's similar to the Glossier 'Perfecting Skin Tint' but it's a quarter of the price and has much better coverage. I like my coverage to be really light because, as mentioned, I don't like feeling as though I have anything on my face, so on some days when I'm not really doing anything I do prefer the Glossier one. But overall, this is far better priced and covers up any imperfections, unlike the Glossier product. I usually just blend it in with an ELF blending brush. 5. The next step is bronzer although if I have any breakouts I'll use the ELF concealer before this. I use the Urban Decay 'Beached Bronzer' which is buildable and so easy to apply. It's not too dark or too light which means applying it is effortless and it never leaves any brown splodges on the top of my cheekbones. 6. 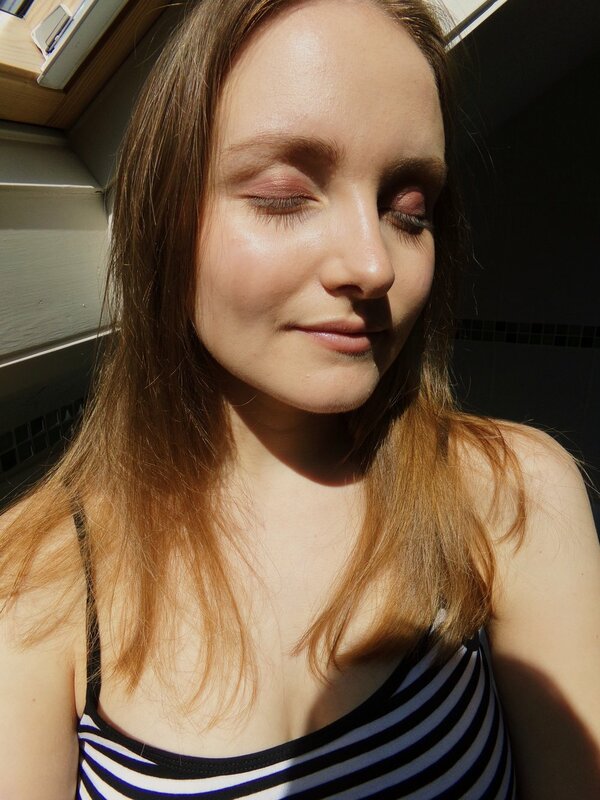 After this I'll either go in with a highlighter or with this Charlotte Tilbury blush stick- more often than not I use this as it's much easier to apply than highlighter and makes for a more natural look. This one is in the shade 'Moon Beach' and it's a kind of coral-y shade that definitely comes with a glow once applied. Super easy to use (can you see a theme here within my routine...) and something I actually get complimented on fairly often, which is always nice! Plus, it smells really good. 7. For someone who is lazy with their make-up, I wear eyeshadow disproportionately often, pretty much every day. I've never been able to do liquid eyeliner and so eyeshadow is the something interesting and varied that I like to add to my make-up routine. 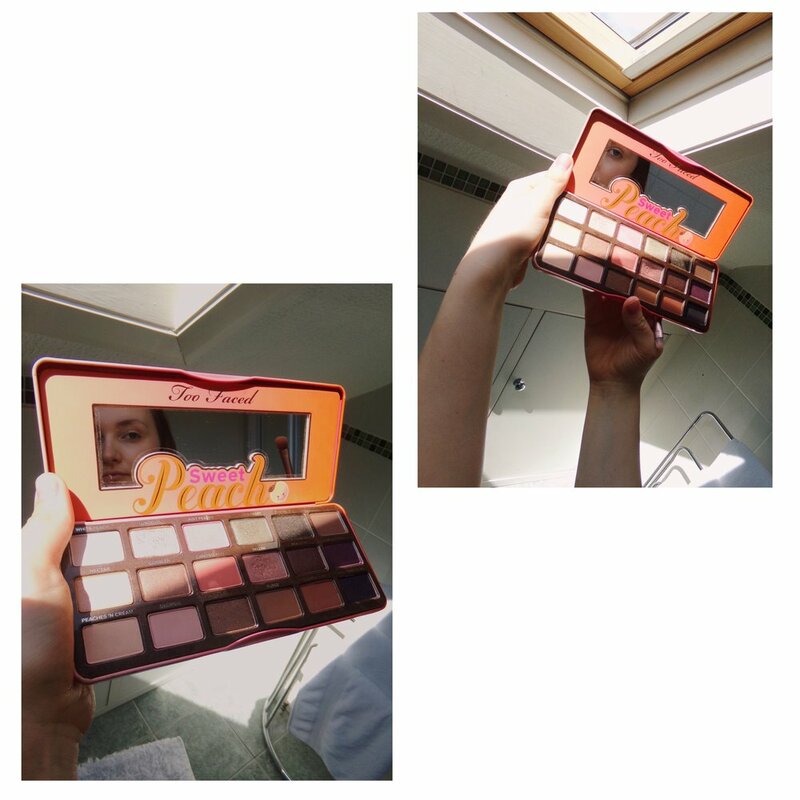 My favourite palette for every day is the 'Sweet Peach' palette by Too Faced. It has a variety of different shades but I usually stick to the lighter ones, although I am partial to some glitter. My favourite and most worn shade is 'Bellini', which I'm wearing in these photos, which is a shimmery dark pink shade that I think brings out the blue in my eyes. 8. Another holy grail product for me is the Anastasia Beverly Hills 'Brow Wizz' in soft brown. For some reason that is completely unknown to me, I have random holes in my eyebrows and this brow pencil allows me to fill them in quickly and seamlessly. I also have bushy eyebrows that grow back quicker than I care to pluck them so an eyebrow brush is necessary for me everyday, even when I'm not wearing make-up. The only annoying thing about the 'Brow Wiz' is that the packaging breaks so easily (as you can see here) which means the spoolie brush that comes with it always disappears within the first week of me owning it. 9. For mascara, I *usually* use the Urban Decay 'Perversion' which is cruelty free however I didn't have it with me when I was taking these photos so I'm just using a random tester- sorry about that! I really don't have much to say about it as a mascara anyway apart from that it works and it's cruelty free and vegan, which is enough for me! I honestly don't know what makes a good mascara and usually can't tell one from another. 10. Finally, I use what is perhaps my favourite beauty product, the Glossier 'Balm Dot Com' in the shade/flavour (?) Birthday. It adds a slight shimmer and tastes incredible and is so soothing for my perennially dry lips. I don't usually wear lipstick day-to-day so I just slap a bit of this on and I'm good to go. I hope you've enjoyed this post despite the fact that I am very apparently not that knowledgable about make-up! I do enjoy doing it and I especially enjoy doing skincare, so expect an evening skincare routine very soon where I can go a bit more into depth about my skin and what works for it. Let me know if you use any of the products I've mentioned and what your holy grail products are in the comments! Also if you are interested in any of the Glossier products I mentioned, you can click here to get 10% off your order!